Our electroencephalography (EEG) system compromises of Brain Products 64-channel Active EEG measuring system that can be used to record high quality EEG signals. The active caps allow for easier adjustments of electrode impedances and give the user more control over their measurement accuracy. Our electroencephalography (EEG) recording system (BrainAmp MR Plus, Brain Products) can be used to obtain integrated EEG and ERP recordings during fMRI scanning, as well as non-fMRI EEG and ERP based recordings. Our EEG lab enables high-fidelity visual and auditory stimulus delivery synchronised to EEG recordings. We also offer the MagLink EEG system, which can be used for simultaneous TMS and EEG recordings. The passive BrainAmp MR Plus system can record during the pulse sequence without compromising the raw EEG data. Clock synchronisation between the MRI and EEG system improves the accuracy of gradient artefact reduction, simplifies the artefact reduction process, and allows acquisition using standard sampling rates. In addition, using the Brain Products 'multi-trodes' (MR-safe electrodes) with the BrainAmp ExG MR box, you can easily perform reliable EMG and ECG measurements inside or outside the scanner. Ability to synchronise recordings with external triggers. 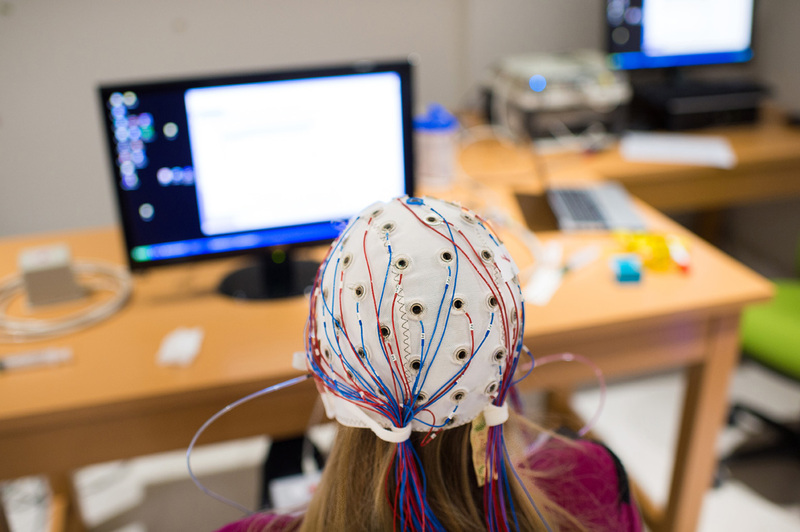 Monash University researchers have used MBI’s EEG facilities to investigate how attention is focused and diverted, and how attention interacts with what we consciously perceive. Even when we focus our attention on a single object, we experience periods of high and low focus that alternate many times per second. These rapid changes in attention – known as attentional sampling – are imperceptible to us, but allow our brains to capture information about the surrounding scene and enhance it for analysis. Read more about this research.